These pictures are a simple intro to Thinking Home 2. 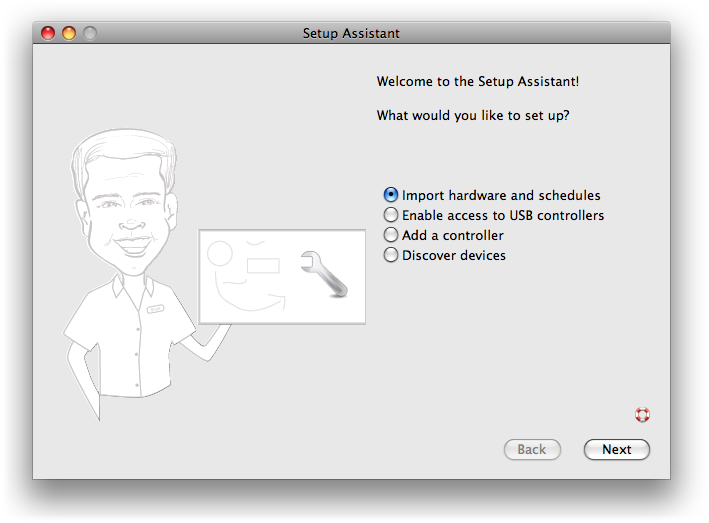 The experience starts with the Setup Assistant. 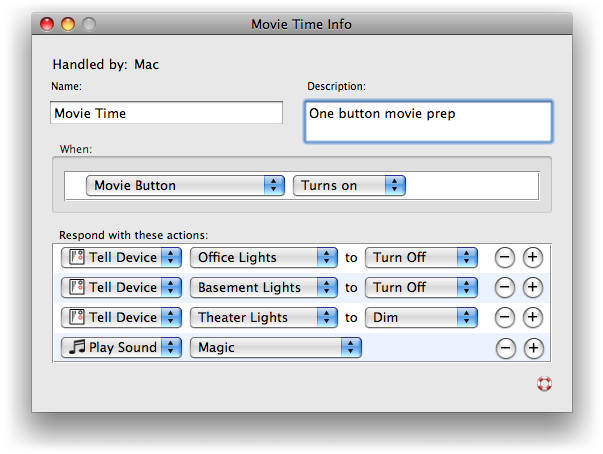 It makes it a cinch to get started and helps import information from other home automation apps. This can be a real time-saver. 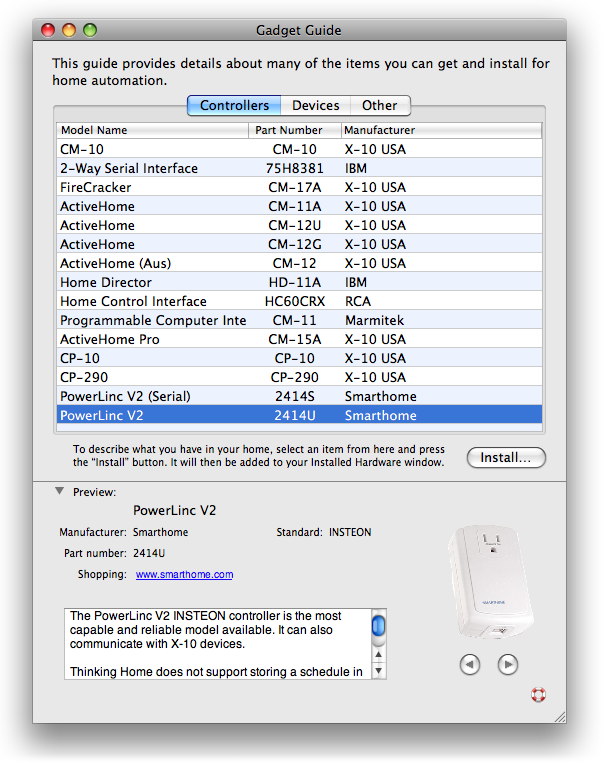 Also, for popular USB models like the PowerLinc V2 or ActiveHome Pro, you’ll need a file installed and the Setup Assistant simplifies this. The next window to visit is the Gadget Guide. Thinking Home 2 supports more than 140 models of gadgets. The Gadget Guide is where to find the supported models. It also includes shopping links so you can shop for new hardware. If you don't find what you need, let us know — we may be able to add it very soon. An important use of the Gadget Guide is to describe what you have. When you select a model and press the Install button, Thinking Home adds one to your Installed Hardware window and it is ready to customize. 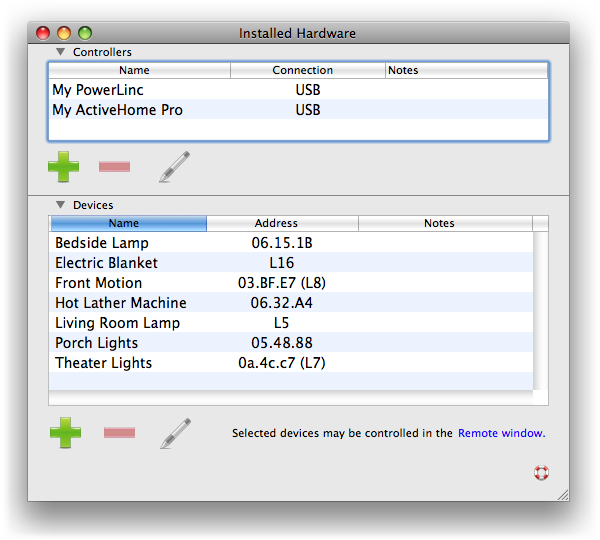 This is how Thinking Home “knows” what devices you have installed. 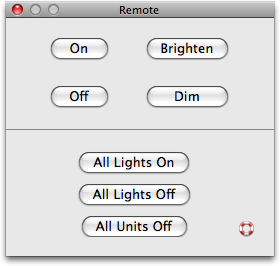 When you select a device in the Installed Hardware window, you can operate it using a contextual menu or from the Remote window. 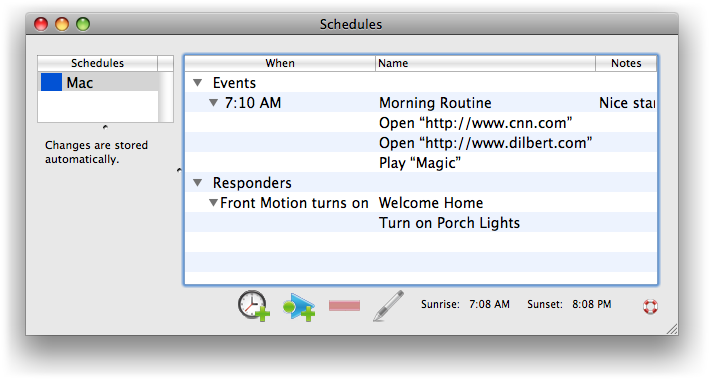 The Schedules window is where you can create scheduled events. Responders are also available. These used to be called “macros”. They respond to actions. A simple example is that a responder might be triggered when a motion sensor turns on and the responder will carry out other actions, like turning on the lights in the room. 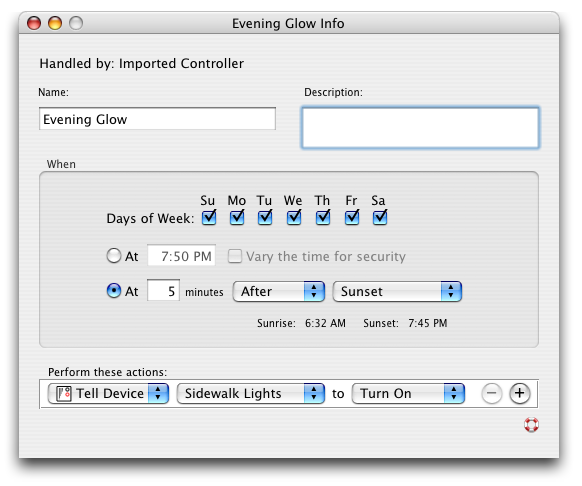 Although Thinking Home 2 stores normal schedules in controllers, it is also able to handle Mac-related things like email, instant messaging, logging and many kinds of scripts. A simple event is one that turns on the sidewalk lights each day at dusk. A favorite responder is one that uses a single button press on a handheld remote to adjust all the lighting adjacent to the home theater. 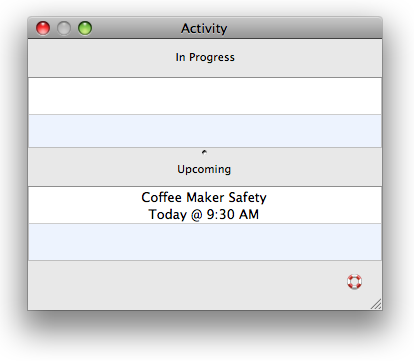 The Activity window shows activities in progress and events scheduled in the next hour. Logging is included, of course. One nice addition is that you can search for entries that match a phrase. You can even use regular expressions for powerful pattern-matching. Try out Thinking Home 2 for yourself. Visit the download page and get a free demo.